Screams from the West is a vertical slice of the intended final gameplay. All of the planned mechanics are implemented, but it is not a final product. Screams from the West takes place in the 1870 Wild West. It features cooperative survival gameplay, where players must work together to rid their small town of giant spiders. To do this, players must seek out and destroy several spider nests placed around the map. 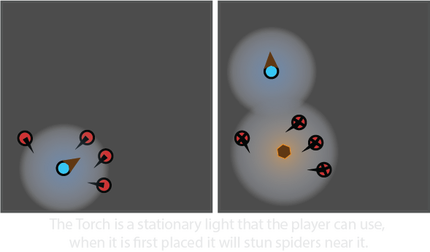 Screams from the West had two focal points which influenced my design decisions: player cooperation and nonlethal player mechanics. These two elements influenced the systems I created, how I designed levels, and the difficulty of the game. To start with our main mechanic was a simple lantern since it supported both of these goals, more mechanics were then added throughout the design process. While the game is playable in a single player mode Screams from the West is designed from the ground up for multiplayer. In a multiplayer game session the difficulty scales allowing for a challenge with any number of players. Task: Create systems to help players survive but don't make them feel over powered. Solution: The main threat in the game is being surrounded by spiders so I created several mechanics that allow players to save themselves and their allies. 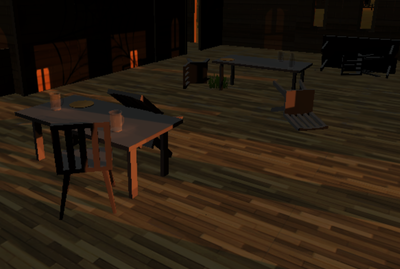 The first mechanic we implemented was the Lantern. Since the game takes place at night, we wanted to be sure that players always had a means to see where they were going. Originally the Lantern had a fuel system that slowly used up fuel whenever it was out. Through testing we found that players did not use the lantern because of this system. The fuel use was changed so that it was only consumed when the Flash mechanic was used. The Rifle was created to directly complement the Lantern. It changes the player's range of sight and allows them to stun spiders at a distance. When the Rifle was first implemented, it would kill the spiders, but it turned the game into a bug hunter and detracted from the cooperative aspect of gameplay, which was being encouraged. Therefore, I decided the Rifle would stun spiders and a sound system was added so it would attract spiders to Rifle fire. From testing, we learned that players didn't like going into dark buildings. To solve this problem the Flare Gun was created. This mechanic allowed players to light up an areas so they could assess the threat. The Flare fired in an arcing motion and would stun spiders near it when it hit the ground. The light from the flair only lasts for a short duration. It was also found in testing that players would often get lost while exploring the dark map, I developed the idea of placing torches. These torches could be used to orient the players and signal to team members an area had been searched. In addition Torches have an area of effect that stuns spiders when they are placed. In testing, players were having a hard time escaping from spiders once they were surrounded. A Bottle throwing mechanic was implemented to help with this issue. Players could throw a bottle and spiders would investigate the noise where it landed. Players used this to distract spiders chasing themselves and their teammates. Each of the tools listed above consumes its own resources when they are used. This adds a level of realism to the game causing players to think before they act. Through QA we also found that doing this encouraged players to use all of the tools they were given access to, instead of just focusing on one. 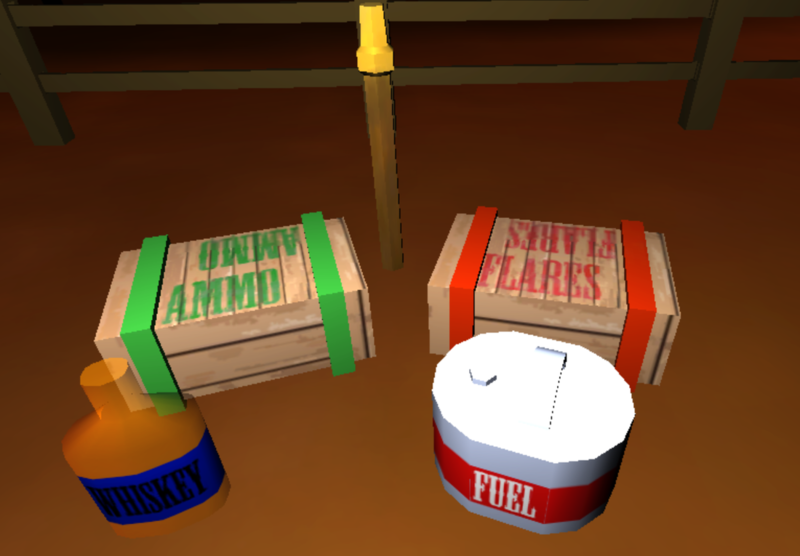 Initially we had colored squares representing the different pick up items, but players said they were hard to tell apart in QA. For this reason I created placeholder assets for the pick ups using Maya and Photoshop. ﻿Task:﻿ Create a level that feels dark enough to support the feeling of the game but have enough lights to help guide the player. Solution: To make the dark areas feel appropriately dark I would contrast them with an area nearby that was much brighter. This helped with guiding and orienting the player without changing the mood of the game. The level layout was based on a town in western Colorado called Mancos. I researched what Mancos might have looked like in the 1870's and used this to guide me when making the level. After the initial layout was completed, QA feedback was used to iterate on the layout. 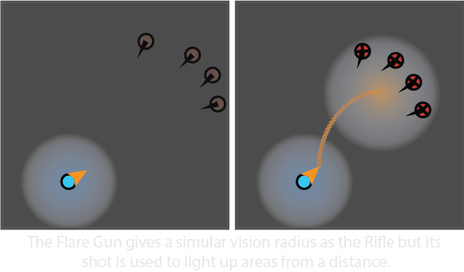 The player has two objectives in this game: to collect gold and destroy spider eggs. To ensure that no two play throughs are exactly the same, we used a procedural placement system for the mission objectives in the level. In Unity I would place potential spawn points for gold, spider eggs and spiders. These spawn points would then be chosen randomly at the start of the game to be the location for the objectives in that play through. The amount of objectives placed would be based on the number of players in that match. Solution: I used the licensed Foley library that I had access to and free sounds online with a Creative Commons 0 license as a starting point for all of the sounds in the game. I would then edit the sounds to the length that was needed in Adobe Audition and make simple adjustments to them as needed. Each file would then be saved using our naming convention and I would update the master sound list saying what the sound was for.